Here is some unexpected news from CES: OnLive, the company best known for streaming video games over the Internet, just announced that it will release a new iPad app later this week that will give users access to a virtual Windows 7 desktop with access to Word, PowerPoint and Excel, as well a browser (which we assume will be Internet Explorer). The free app will offer 2GB of storage. OnLive also plans to launch a pro version for $9.99 per month with 50GB of cloud storage. According to PC Magazine, the company also plans to launch an enterprise version in the future that will allow customers to run their own applications. Given that OnLive generally pushes for more graphically demanding content through its network, running Windows 7 should prove to be rather easy for the company's engineers. The app will officially launch on Thursday, though sign-ups will launch later today. OnLive already has some experience with the iPad, thanks to its OnLive Viewer app, which allows you to watch games others are playing on the service. OnLive full gaming app, though, is currently only available on Android, but the iPad version should launch soon as well. How Useful is a Windows 7 Desktop on an iPad? It'll be interesting to see how much demand there is for a service like this beyond the first surge of people who will inevitably just want to try the app for the sake of it. Given that the latest versions of Microsoft Office allow users to save their content to Microsoft's own LiveDrive service, moving data in and out of the virtual Windows 7 instance should be easy. It's not clear how much else you can do with the app beyond editing office documents, though, and given that you can already edit office documents with the help of iPad apps like CloudOn, it remains to be seen how useful this service will be for mainstream users, especially given that Windows 7 isn't exactly optimized for tablet use. Apple just launched iTunes Match, its cloud-based music backup and streaming service for iOS, Mac and PC. With iTunes Match, users can store up to 25,000 of their own songs from iTunes in the cloud. Unlike others music locker services (including Google Music and Amazon’s music locker), Apple managed to get a license from the music labels that allows it to just check whether it offers a certain song you have in your library in its store and then make that copy available to you. Because of this, you don’t have to upload your songs to Apple – iTunes will simply “match” your library to its cloud library and play back those songs instead of your own copies. This also means you won’t have to wait hours (or maybe even days) for your music collection to upload to Apple’s servers. Only those of your songs that aren’t in Apple’s library will need to be uploaded. iTunes Match is currently only available in the U.S. and it’s not clear when (or even if) Apple will release this feature in other countries. This also means that you will likely get better-quality versions of all those files you may downloaded from Napster a few years ago. iTunes Match makes all downloads available as DRM-free 256kbps AAC files. Indeed, given that Apple doesn’t check whether you actually own a license to a given song, this new program is virtually equivalent to a piracy amnesty that costs you just $25 a year instead of thousands of dollars in potential RIAA lawsuits. To get started, just make sure you have upgraded to the latest version iTunes (10.5.1) that come out today. You can download this new version from Apple. Update (11am PT): Looks like it’s working now and ready for new sign-ups. Instapaper, the popular distraction-free offline reading app for iOS, was probably among the first few apps I installed on both my iPhone and iPad and it has never left their respective homescreens since. Today, its developer Marco Arment launched version 4 of the app. It’s available in iTunes now and brings numerous new features that both new and existing users will appreciate. Among these are a redesigned interface , the ability to multi-select articles to archive, delete or move them in bulk, the ability to look up words in Wikipedia and support for footnotes from most websites. The new design, which is most noticeable on the iPad, moves away from the list view and towards a more grid-like display of your saved articles. 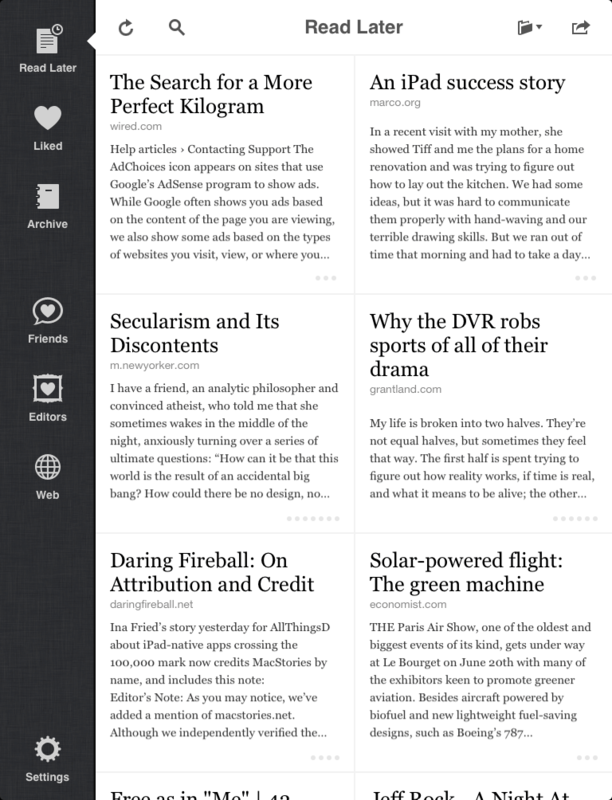 According to Instapaper’s developer, this makes for a more touch-friendly interface. The navigation options on the iPad are also now always in the left sidebar. On the iPhone, the changes are a bit more subtle, but regular users will appreciate that the top status bar is now off by default, giving you more space for your articles (there is an option to turn it back on, though). With the status bar gone, though, you can obviously not check the time while you’re reading. To do so, you have to click on the Actions button in the lower toolbar, which will let the status bar slide back in for a moment. Instapaper now also lets you connect your Facebook, Twitter and Tumblr accounts to pull in all the articles your friends have shared on these services. 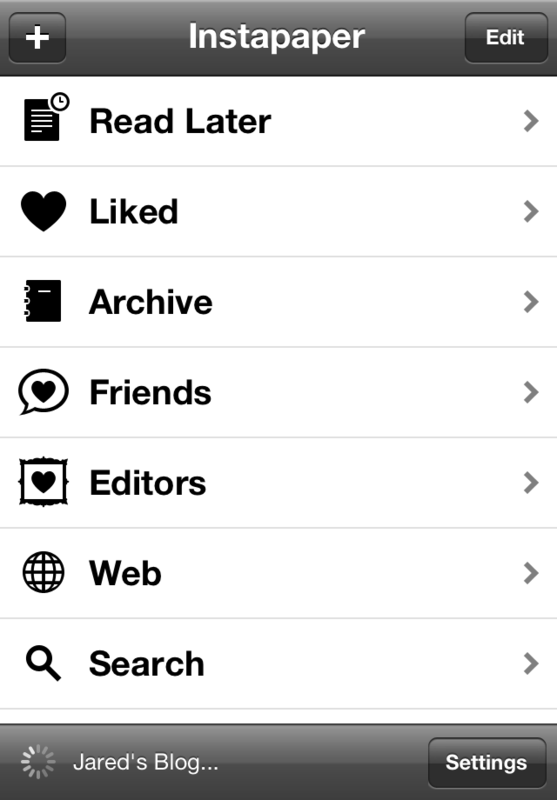 Until now, Instapaper only showed articles your friends liked on these services when they were also Instapaper users. It’s worth noting, though, that these links aren’t downloaded in the text-only view by default, but that you actually have to open up the actual website in the app first and tap the “Read Later” button before they are saved. This will likely make publishers happy, as they can still count ad impressions, though it may confuse the app’s users a bit at first. One interesting new feature is also the ability to search through the articles you have already downloaded. This is a paid feature, however, available through in-app purchasing and Paypal. This new features costs $2.99 per 3 months. Other minor updates include better support for displaying the names of authors and publications, support for Wikipedia definitions, footnotes (though, arguably, only a few websites really use them), and an app directory that showcases Instapaper-compatible apps. There are, of course, a number of smaller tweaks as well. You can find a full list here. When Apple announced iOS 5 earlier this week, a lot of the discussion after the announcement was about the third-party tools Apple may have killed by copying a good part of their functionality. One of the most obvious candidates for this death row was Instapaper, the popular tool that allows its users to easily save articles for later and then displays them in a pleasant, text-centric view without ads or widgets. With Safari’s new Reading List feature, which also allows users to bookmark stories, sync them between computers and then read them later, it did indeed look as if Apple was going to put a stake through Instapaper’s heart. After spending some time with Safari on iOS, though, I can’t help but feel that Apple’s tool is far too limited to pose a real challenge to Instapaper. Apple’s Reading Lists are basically just glorified bookmarks. While Instapaper lets you save articles in its easy to read text-only view, Reading Lists don’t make use of Reader, Apple’s new text-only mode for Safari at all. Reading Lists just take you to the original article and then you have to click the Reader button – Instapaper already formats the story for easy reading. Even if you add an article to your Reading List while you’re using Safari’s Reader feature, you will still just get a bookmark to the original page. Another problem with Apple’s tool is that there doesn’t seem to be an offline mode. iOS 5 is obviously still in beta and this could change, but for now, you can’t save a few articles before you leave and then read them on the plane. That leaves Instapaper or its close competitors Read It Later and Readability as the only real option for those who want convenient offline reading. This, combined with the fact that you will have to use Safari on the desktop to make use of this feature, makes me think that Instapaper can only profit from Apple’s efforts. As users get frustrated with the limitations of Apple’s Reader and Reading List, they will likely look to Instapaper and Co. as alternatives. iCloud Isn’t a Replacement for MobileMe: Is Apple Completely Backing Away from Web Apps? One thing I completely overlooked when Apple announced iCloud yesterday was the fact that it’s not replacing the current MobileMe email, contacts and calendar apps with better ones – it’s shutting all of its Web apps – including the MobileMe photo galleries – down altogether. Apple’s iCloud site doesn’t make any mention of these services whatsoever – instead, just like iTunes in the Cloud is all about syncing music files and not streaming them over the web – MobileMe’s core features have been replaced with better syncing tools. Why is Apple Trying to Crush All the Rumors Around its WWDC Keynote? In what is an unprecedented move for Apple, the company this morning announced what it plans to announce during its keynote at the company’s Worldwide Developer Conference (WWDC) next week. Typically, these events are shrouded in mystery and the days ahead of the conference are ripe with rumors and speculations as to what will be announced and who will announce it. Not so this year. Apple didn’t just announce the obvious – that we will see a preview of iOS5 and OS X Lion, but also that it will indeed launch a new suite of cloud-based services under the rumored iCloud name. While the Apple Kremlinologists will continue to speculate whether the fact that Apple announced that its “CEO Steve Jobs and a team of Apple executives will kick off” the event means that Steve Jobs is coming back from his medical leave or not, the fact that Apple pre-announced Jobs’ presence at the event is also unprecedented. So why did Apple announce all of this? My personal feeling is that it’s all about setting expectations. Those who don’t follow tech news closely are likely still expecting to see the iPhone 5 (as the WWDC has traditionally been where Apple announced its newest generation of phones). Today’s announcement makes it clear (by omitting any reference to hardware in general), that we won’t be seeing a new iPhone at WWDC. In the past, speculations around new devices often got so far out of hand that the actual product had to be a letdown (what? no solar-powered iPhone?). Apple has been getting better at setting expectations lower through planned leaks, but it looks like the company is now also ready to be a bit more open about its plans for the immediate future. Now that Amazon and Google are offering music lockers, it’s also likely that Apple wants to keep the buzz around its iCloud offering going for another week (Amazon stole some of that with its $0.99 Lady Gaga promotion). Apple’s offering will likely be more comprehensive than this, but a music locker will likely be the key feature of its new iCloud service. Or: Setting up a Bigger Surprise? On the other hand, this is still Apple. Maybe this press release is just misdirection and the company does have “one more thing” ready to go at WWDC (iPhone 4S? new Apple TV with apps?). There are, of course, still lots of questions about what iCloud is really about (will it be integrated with iWork, for example? ), what’s in iOS 5 and what unannounced features Lion still has in store for us. At least, however, the speculation will focus on this and not on new hardware. Opera today released the latest version of its Opera Mini mobile browser for iOS. This is Opera’s debut on the iPad. On the iPhone, this new version marks a huge step up from Opera 5, which was virtually unusable due to they way it displayed the rendered text. This new version has none of these issues and feels incredibly fast and smooth. On the iPad, however, it’s generally unusable, though this is not necessarily Opera’s fault: most websites automatically switch to a stripped-down mobile view when they see a request from Opera Mini, no matter the size of the screen the site is rendered on. This means lots of screen estate simply goes wasted and usability suffers. The ‘Mini’ versions of Opera, which are also available for a wide variety of other operating systems, doesn’t actually render the sites on the mobile device. Instead, every website you request passes through Opera’s servers, is compressed and then sent to your phone or tablet. This makes it very fast, but in the first iPhone version, Opera was a bit too aggressive about how it compressed text and images. With regards to features, Opera can hold its own with other third-part iOS browsers like Atomic Web and Perfect Browser. The browser does, for example, feature Facebook and Twitter sharing, full-screen view and support for bookmark syncing with Opera Link. What’s missing, though, is the ability to switch the user agent so Opera Mini can identify itself as a desktop browser on the iPad. As all other third-party iOS browsers, Opera also suffers from the fact that users can’t set it as the default browser. Even if you love Opera, the iPad will still open Safari when you click on a link in an email. As more information about the “secret” location-data file on Apple’s iPhone 4s and iPad 3Gs becomes available, the story surrounding this discovery is becoming more about the people involved than the location data itself. As it turns out, Alex Levinson, a student at the Rochester Institute of Technology, had long discovered this file in his research and work with forensic firm Katana Forensics. Katana Forensics produces a tool called Lantern, which can extract this data and map it in Google Earth’s KMZ format. Levinson also presented his findings in an IEEE journal all the way back in 2007. So why did the blogosphere and mainstream press go crazy about this affair yesterday (including me) and why was Levinson, who emailed virtually all major publications about this yesterday afternoon Pacific Time, ignored by all but a few outlets (again: including me)? Note: a lot of this is inside baseball about how the blog sausage is made. If that’s not of interest to you, here is the tl;dr: Levinson’s email to the press was flawed and his research was only available in academic publications. Why Was Levinson Mostly Ignored? “He adds that the press missed the story first time around, and now seems more focused on the horror of data storage than the reality (there, for example, is no evidence that the data is sent back to Apple at the moment). To his point about missing the story the first time around: it’s a point well taken, but I should also note that his research was published in 2007 in the Hawaii International Conference for System Sciences 44 – not a publication most journalists and bloggers read at bedtime. He also published more about this in a book on iOS forensic analysis, but that, too, isn’t something even those of us who did a bit of research on this topic yesterday could have easily spotted. The sad reality is, neither the press nor blogosphere was going to pick up on this story unless somebody made us aware of it. As far as I know, nobody did. a) he didn’t use bcc and cc’ed everybody on the list (a pet peeve of reporters and other cubicle dwellers alike). Given the amount of emails flowing into most bloggers’ and reporters’ inboxes, emails like that immediately go to the bottom of the pile, especially after the second comment about the missing bcc arrives. A rookie PR mistake. b) none of the pertinent information (links to the old publication etc.) was in the email – just a link to a blog post and to a blog nobody had ever heard of. Also, statements like “You will want to read this” and “it would be in your best interest to review what I have to say” are something most of us read about 50 times a day and just ignore. The fact that I failed to see the value in Levinson’s pitch is obviously nothing to be proud of, but I thought you deserved a bit more of an explanation for why this story went mostly unnoticed the first time around and why Levinson’s voice was not heard until the news cycle was already over. I’m glad it’s being heard loud and clear now. Google didn’t just give a free a Chrome OS netbook and either a Motorola Xoom tablet or Nexus S phone to every developer at the Game Developer Conference in San Francisco this week, but also just launched a new hub for game developers who want to use Google’s own tools. Google Game Developer Central provides developers with information about Google tools and standards like GWT, WebGL and HTML5. Google, of course, would also like these developers to use AdMob and AdSense to monetize these games. As Apple unveiled the new iPad 2 this morning, Steve Jobs took a direct jab at Google, pointing out that there are currently only about 100 apps for Honeycomb tablets and over 65,000 for the iPad. While Apple’s presentation today didn’t mention too many games, the improved graphics will make the iPad an even better platform for game developers. To counter this, Google needs to get more game developers on its platforms. Giving away freebies at conferences has long been a tradition for Google and others are doing the same now, too. Microsoft gave free Windows Phones to everybody at its Professional Developer conference this year (excluding members of the press), which surely helped Microsoft garner extra support from its developer ecosystem. When Will AT&T Users Get the Verizon iPhone’s Personal Hotspot Feature? For the most part, today’s Verizon iPhone announcement was exactly in line with what most pundits expected: same phone, different network. One intriguing feature of the Verizon iPhone that AT&T doesn’t currently offer, however, is the ability to turn the phone into a WiFi hotspot for up to 5 devices. Wouldn’t it be nice if AT&T also offered this feature soon? There is nothing specifically “Verizon” about this feature. Technically, AT&T’s network is just as capable of supporting this feature as Verizon’s and there are already third-party apps for jailbroken iPhones out there that offer this capability and that work reasonably well. The Verizon iPhones that were on display in New York today ran iOS 4.2.5, a currently unreleased version of the iPhone’s operating system. On Verizon’s iPhones, turning on the hotspot feature is as easy as going to the settings menu and turning the feature on. It’s integrated directly into the OS. Just a Question of Time? So will AT&T support mobile hotspots once Apple releases the next update to the iOS? My personal guess is that it will take the company a bit longer before it releases this feature to its users. After all, it took AT&T years before it even officially allowed tethering and the hotspot feature would put even more of a strain on the company’s network. For now, I’m guessing AT&T will start offering this feature once the next generation iPhone is available and it will surely charge a hefty fee for this feature as well (we don’t know anything about Verizon’s pricing plans for the iPhone yet, so the price could turn out to be a non-issue). Overall, though, it will only be a matter of time before AT&T users will get this feature as well.